3 x 15 repetitions twice per day with extended knee, and another 3 x 15 repetitions twice per day with a flexed knee. All exercises were 7 days per week. Patients were told to continue to exercise with pain unless it became disabling. Patients were allowed to jog during their 12‐week rehabilitation so long as it caused only mild discomfort. Figure 1. 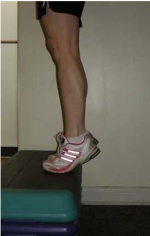 From an upright body position and standing with all body weight on the forefoot and the ankle joint in plantar flexion lifted by the non‐injured leg (A), the calf muscle was loaded eccentrically by having the patient lower the heel with the knee straight (B) and with the knee bent (C). Figure 2. Once the eccentric loads were performed at body weight without any discomfort, subjects were given a backpack that was successively loaded with weight. In this way their eccentric loading was gradually increased. If very high weights ended up becoming needed then the subject used a weight machine. ↑ Silbernagel KG, Thomeé R, Eriksson BI, Karlsson J. 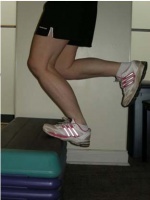 Continued sports activity using a pain monitoring model during rehabilitation in patients with Achilles tendinopathy. Am J Sports Med. 2007;35(6):897‐905. ↑ Alfredson H, Pietila T, Jonsson P, Lorentzon R. Heavy‐load eccentric calf muscle training for the treatment of chronic Achilles tendinosis. Am J Sports Med. 1998;26(3):360‐66.